This cartoon by Thomas Downey appeared in Points from the Playhouse, a series of cartoons in The Bystander, a weekly magazine published in Fleet Street featuring reviews, cartoons and short stories. Established in 1903, it ran until 1940 when it was merged with The Tatler. The cartoon was a comment on the fortunes of the Lyceum Theatre whose interior was entirely remodelled in 1904 to the designs of the architect Bertie Crewe, and which re-opened on 7 January 1905 as the New Lyceum, a Variety Theatre vying for popularity with the Palace Theatre and the London Coliseum. 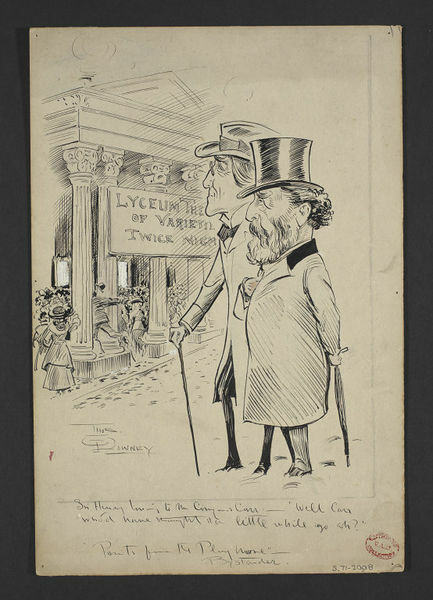 Sir Henry Irving, the Lyceum's great actor-manager who had worked there from 1871 until 1902, is seen with the dramatist, critic and journalist Joseph Comyns Carr, who wrote for the Lyceum and managed the theatre from 1899 until 1904. Irving had made the Lyceum the home for grand dramatic spectacle such as Comyn Carr's play King Arthur, but by January 1905 the audience thronging the entrance had come for delights including the bird-whistling of the Permane Brothers, Mlle. Wilma's pictures in smoke and sand, and Taylor's performing elephants. 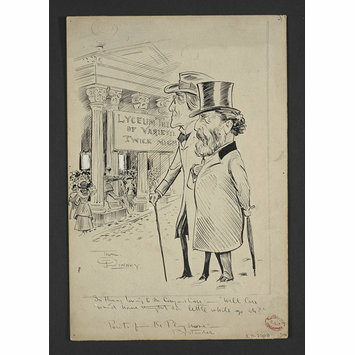 Pen and ink cartoon showing Sir Henry Irving wearing a brimmed hat and holding a cane in his right hand, walking with a bearded Joseph Comyns Carr wearing a top hat, outside the Lyceum Theatre in Wellington Street in 1905. Irving is observing, seeing crowds packing into the entrance of the theatre which is advertised as 'Lyceum Theatre of Varieties. Twice Nightly': 'Well Carr who'd have thought it a little while ago, eh?' Originally it appears as if posters were depicted in the two poster frames on the wall under the colonnade, but whatever was in the frames has been covered in white paint to appear blank. Sir Henry Irving (1838-1905) and Joseph Comyns Carr (1849-1916) musing on the fate of The Lyceum Theatre. Cartoon for The Bystander 11 January 1905. Pen and ink by Thomas Downey, 1905.